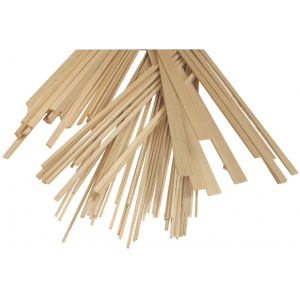 Selected Triple A Grade balsa wood strips cut to very close tolerances. * Sizes listed are for l" scale models. * Use for any type of model building especially aircraft architectural or engineering models. * Balsa wood is light and soft but very strong. * Can be easily cut and shaped with hand tools sanding blocks and X-Acto®-style blades. * Lightly sanding the wood produces a smooth velvety feel. * Finishes easily with standard water-based paints or varnishes. * 40 pieces per bundle. The quantity is 40 strips.